Have you been searching online for “notary services near you”? Do you need a document notarized on the go and can’t make it into one of your local offices? 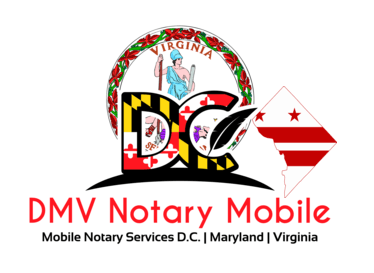 DMV Notary Mobile offers mobile notary services to help suit your needs. A professional notary will travel to you saving you the time and hassle of making a trip to the notary’s office. There are a wide variety of legal documents that need notarized, from escrow accounts, power of attorney, advanced healthcare directive, deeds, selling a house and affidavits to contracts opening a new business, and having a notary able to come to you makes getting documents verified that much easier. Instead of coordinating getting multiple people into an off-site office to finish a contract, bringing the notary to your location means you can complete your legal documents on your timeline. Mobile notary services are fast, easy, and convenient, while still giving you the quality, professional results you require. If you need a letter or other form notarized, a licensed professional at DMV Notary Mobile can help you notarize your collection of documents. Read more about Mobile Notary services in our blog! You can fill out our contact form or call us now at (202) 826-8179 to discuss your litigation and mobile notary needs!